Gerber began the production of handmade cutlery back in 1939. It was not until the 1960s that they became one of the well-known knife manufacturers in the business. They are well known for their high quality products. Also, Gerber was the first company to collaborate with a custom knife maker, David Murphy. That was in the late 1930s. That collaboration resulted in the production of tens of thousands of knives that were used by soldiers in World War II. The inventor and popularizer of drop-point blade, Bob Loveless, has also designed knives for Gerber. Lately, Gerber has collaborated with Bear Grylls, of Man vs. Wild fame, to produce a variety of survival knives. Gerber has a vast range of knives including almost all types of knives to suit your needs. Gerber has an excellent industry standing as well. Most of their knives are very well rated and widely used. Kershaw, another popular knife manufacturing company, was created by a former employee of Gerber, Pete Kershaw. For the scope of this topic, we are not going to get into comparison between any companies, and will talk individually about the manufacturer. We will now be checking out some Gerber knives suited for hunting. One thing to keep in mind is that we are trying our best to lean towards mainly drop point blades as much as we can, owing to it being better suited for hunting. So let’s begin. 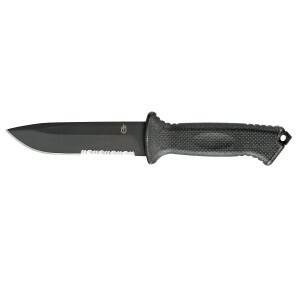 Gerber 46904 Gator Fixed, Fine Edge Knife with Drop Point: In the Hunting section of the Gerber website, you will find this Gator Fixed, fine edge knife. It is a drop point blade with a length of 4.5 inches. It is a light and durable knife with 420HC Stainless steel, which is an improved version of the 420 stainless spring steel. Click here to get this beautiful knife on Amazon! Gerber 22-41121 Prodigy Survival Knife: The Gerber 22-41121 Prodigy is one of the top rated, reasonably priced survival knives out there. The blade is coated with black oxide, which is a good touch as it resists corrosion to some degree, and the blade won’t flash out in the sunlight. At the time of this writing, the Gerber 22-41121 Prodigy was rated very well. For the price, it is a very high quality knife. The Wallowa Stag fixed blade knife is one of the best looking Gerber hunting knives. It features 3.75 inch long stainless steel blade with gut hook to make gutting easier. 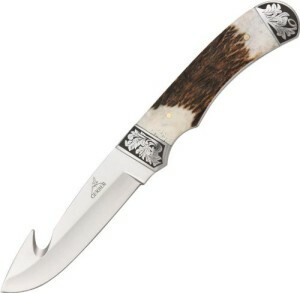 The handle is made of genuine stag and features beautiful etched bolster. You can expect the knife to arrive with razor sharp edge. A genuine leather sheath is included. Click here to get the Gerber 22-01842 from Amazon! Skinning requires high quality and razor sharp knife. The Gerber 22-48398 E-Z Skinner is one such knife, which will make the whole skinning process much easier than it usually is. 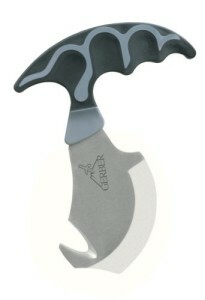 It is designed specifically for skinning and features a high carbon stainless steel blade with gut hook. The blade is approximately 2.5 inches long and is frighteningly sharp. It will feel like you are running a hot knife through butter when you will use the knife for gutting game. The handle is made of co-moldedbination of rigid thermoplastic and Gerber’s acclaimed SoftGrip. Click here to buy the Gerber 22-48398 E-Z Skinner from Amazon! And as the fifth model, we have here the Gerber 31-001095 Myth Fixed Blade Pro, which is a full tang hunting knife with gut hook. Its blade is 3.75 inch long and is made of high carbon stainless steel. The knife has a slim profile and is extremely lightweight. Packed together with the knife is a special sheath, which features a built-in carbide sharpener, allowing you to sharpen your knife easily in the field without having to worry about losing the sharpener. Just like most of the other Gerber hunting knives, the Gerber 31-001095 enjoys positive reviews from the customers. Currently this model is one of the best rated Gerber knives. Click here to get the knife from Amazon! With Gerber, you also get good customer service. They will usually attend to your problems as soon as they can. Gerber provides 25 years warranty timeframe for their products, ensuring that the products will be free from defects in material/craftsmanship.